The Fusion Grey Fabric Bed Finished in sumptuous Grey Fabric. This bed frame comes in a choice of Sizes. 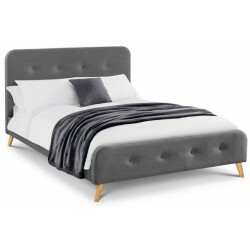 A Stunning Fabric Bed in a very low Price.The sleek, contemporary design of the Fusion Fabric Bed makes it an excellent choice for the modern bedroom. The Carrie Storage Fabric Bed Frame is finished in sumptuous Chenille Mink Fabric to bring a touch of luxury to the modern bedroom. This handsome bed frame is offset by board base. The Jalisa Chenille Bed Frame is a stunning bed frame, finished in a mink chenille fabric. Featuring a scroll design, this bed frame will bring a touch of contemporary elegance to any bedroom. he sprung slatted base provides extra comfort and a supportive surface for your mattress for a restful night's sleep.